There are some amazing Truckee Backpacking and Hiking Trails. I will be covering the Trails for Day Hikes on the Truckee Hiking page, and the longer Trails that typically involve camping along the way will be covered on the Truckee Backpacking page. Camping tips are available from the Truckee Camping page. There is an opportunity below, to share YOUR Truckee Backpacking story with Truckee Travel Guide. Each Truckee Backpacking Story will be turned into it's own web page on the Truckee Travel Guide website, and YOUR Friends, Family, and others can comment on YOUR story! My brother Scott Smith, earned his Boy Scouts Eagle Scout Award when he was 14 years old, when we lived in Novato, in Marin County. As a boy scout, it is typical to hike and backpack a lot, and generally there are many opportunities to go on long 50+ mile backpacking trips. A new generation has arrived, and Scott's son, my nephew, Kyle Smith, age 12, is now a boy scout in Roseville, California's Boy Scout troop # 1, working towards his own Eagle Scout Award. Scott is an Assistant Scout Master for Kyle's troop. 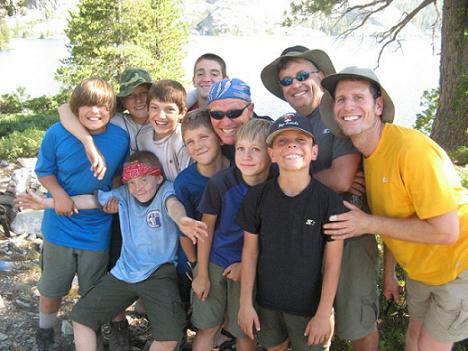 In July 2010, Troop 1, spent a week in the Sierra Nevada's on a 50 mile hike starting from Chubb Lake at Marin Sierra, and hiking the Grouse Ridge and hiking to the summit of Old Man Mountain, the gorgeous Mountain that you can see from Hwy 80 as you pass Nyack on the way to Truckee. The best views of the Grouse Ridge and Old Man Mountain, can be enjoyed from the viewpoint stop at Nyack heading on Hwy 80 back to the Bay area. Started from Chubb Lake at Marin Sierra Boy Scout Camp off of Hwy 80. Their backpacking trip ended up being 56 miles. They climbed 12,165 Vertical Feet! 8 Scouts from Troop 1 went on the trip - 3 eleven year olds, 4 twelve year olds, and 1 thirteen year old! What a fantastic accomplishment! The Boy Scouts' is such a terrific organization that teaches boys, life skills. I'm sorry that I did not get my son, Ryan into the Boy Scouts. This is a great organization for young boys who do not have their fathers active in their lives - it gives them some adult male role models to spend time with. Powerpoint Presentation about the 50 Mile Trek - Lots of great information that can be applied to any backpacking trip! Please check out my Shopping Deals page for Daily Deals and Sales specials! For a great, ready made Survival Kit, perfect for camping and backpacking, check out the survival kits from Wise Foods. (link below) They make Freeze Dried/Dehydrated Outdoor Food perfect for Backpacking with a 7 year shelf life, and their survival kits include many of the essential items listed above. 2 week deluxe survival product and food kit for 1 person/ 1 week for 2 people. An amazing kit at an amazing price! Sleeping Bag - the typical bag is a three season bag, and can handle temperatures down to 20 or 30 degrees. If you are backpacking in the winter, a warmer bag will be required in the Truckee and Lake Tahoe area. Sleeping Mat - For under your sleeping bag, to cushion the ground. Ski Poles - if you are backpacking over steep, rocky terrain, a set of ski poles can help with your balance. If you noticed in the video, my nephew Kyle and some of the other boys carried a pair. A towel, or lightweight hand towel or packs of moist towellettes. Wood is typically plentiful, if you are in an area that you can build a fire safely, but you should bring some fire starter gel, or lighter fluid. Sponge or Pot Scrubber - for washing dishes. If you are unable to make camp fires along the way, a liquid fuel gas stove, or a propane cartridge stove will be necessary to prepare your meals. Alcohol stoves don't work as well in higher altitudes, like the Truckee and Lake Tahoe area. Each person should bring utensils, bowls, plates, and cups for the trip. 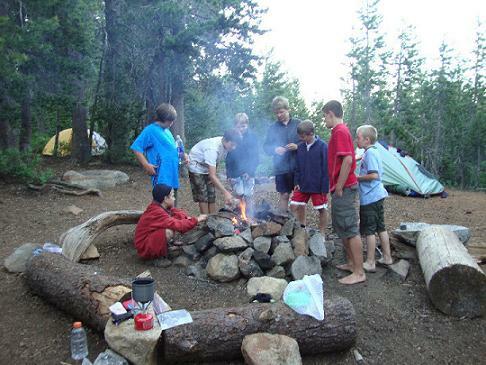 Practicing proper fire safety, they have their camp fire surrounded with rocks and in an open area, away from trees and shrubs etc. Due to the lack of refrigeration along the way on long trips, dehydrated meals work well, and are light to carry. For a great source of Outdoor Meals, please check out Wise Foods. They make Freeze-dried and dehydrated food for Outdoor eating with a shelf life of 7 years. You just add water! Don't go alone! The rule "There is safety in numbers" applies! Leave the environment the way you found it - Do not leave trash behind! If you take a dog with you, pick up after it! 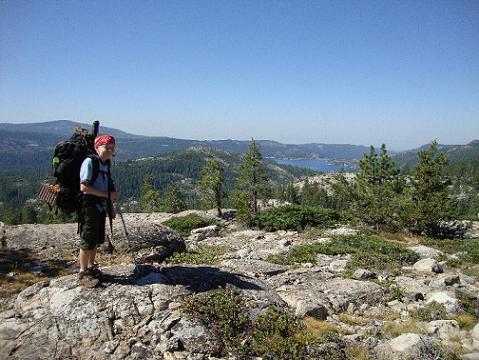 Have A Great Story About a Truckee Backpacking Trip? 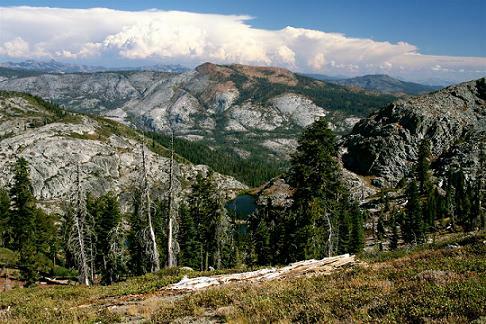 Do you have a great story about Backpacking in Truckee, or the surrounding Sierra Mountains or Lake Tahoe area? Where is your favorite place to backpack? Give us some food tips on what things are great to cook while backpacking! 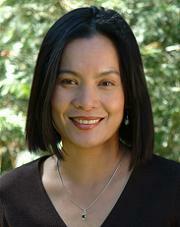 What were the biggest challenges that you had? Any tips on supplies and equipment to bring? Share up to four pictures of your trip! 50% OFF on Outdoor Gear & Clothing at REI-OUTLET! SierraTradingPost.com offers 35-70% savings on name brand Outdoor Gear.